The last time we examined ACCION International was in 2009. In our latest open-ended review of charities, we determined that it was unlikely to meet our criteria based on our past examination of it, so we did not revisit it. The content we created in 2009 appears below. This content is likely to be no longer fully accurate, both with respect to what it says about ACCION International and with respect to what it implies about our own views and positions. With that said, we do feel that the takeaways from this examination are sufficient not to prioritize re-opening our investigation of this organization at this time. What impact does ACCION International's technical assistance have on [[charityname]]'s partner institutions (i.e., the banks it supports)? We have investigated ACCION at three times. ACCION applied for a grant in late 2009, we reviewed ACCION's website in mid-2009, and ACCION applied for a grant in late 2007. Details on each follow below. We reviewed ACCION International in late 2009 as part of our process to distribute &dollar;250,000 in grants to organizations working on economic empowerment in Sub-Saharan Africa. ACCION did not submit information that allowed us to answer the questions above. For sharing a document which details the (a) amount and (b) type of support they provide to each partner institution.5 While this document does not demonstrate impact, it does provide donors with more information about the role ACCION's services play for microfinance institutions than we have seen for any of the other similar organizations we evaluated. ACCION International. IRS 990 form (2007) (PDF). ACCION International. ACCION Partners. We do not have permission to publish this document. ACCION International. Insight #5: Poverty outreach findings: Mibanco, Peru. ACCION International. Insight #8: ACCION Poverty outreach findings: SOGESOL, Haiti. Brown, Marcia. ACCION Vice President, Resource Development. Phone call with GiveWell, September 16, 2009. Brown, Marcia. ACCION Vice President, Resource Development. Phone call with GiveWell, October 16, 2009. Center for Financial Inclusion at ACCION International. Resources. http://resources.centerforfinancialinclusion.org/ (accessed May 4, 2010). Archived by WebCite® at http://www.webcitation.org/5pTpX25nk. GiveWell. Questions for microfinance charities. ACCION International. Active clients. We do not have permission to publish this document. ACCION International. Data on ACCION International's MFI Partners. We do not have permission to publish this document. ACCION International. Historical statistics for selected ACCION partners. We do not have permission to publish this document. ACCION International. Looking back: Our story. We do not have permission to publish this document. ACCION International did not meet either of these criteria. ACCION International applied for our funding and recommendation for saving lives or reducing poverty in Africa, but did not advance past our Round 1 screen, which aimed at finding charities with strong self-documentation. For more information, see our overview page for this grant. 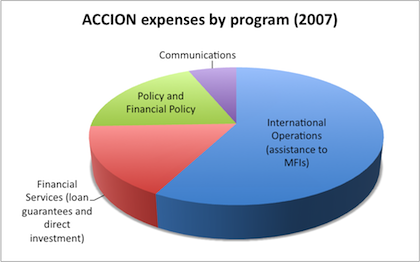 ACCION International was among the charities that did not provide this type of evidence and instead submitted evidence that gave descriptions of their activities relying on one or more of the following: anecdotes, newspaper articles, survey data (types of evidence that we are skeptical about, as we have written on our blog), and evidence of the size of the problems they were attacking - but did not give us information that gave us high confidence that their programs were creating positive life change, or information that we felt could begin to get at their cost-effectiveness in changing lives. It's possible that [[charityname]] has the information we want, and didn't send it due to misinterpretations of our application, time constraints, or other reasons. But due to time constraints of our own, we opted to focus on the applicants who seemed most promising. ACCION International, "IRS 990 Form (2007)," Pg 3. Marcia Brown, phone call with GiveWell, September 16, 2009. Marcia Brown, phone call with GiveWell, October 16, 2009. Center for Financial Inclusion at ACCION International, "Resources." ACCION International, "Insight #5: Poverty Outreach Findings: Mibanco, Peru," Pg 7. 0% of clients live on less than &dollar;1/day; 4% live on less than &dollar;2/day. ACCION International, "Insight #8: ACCION Poverty Outreach Findings: SOGESOL, Haiti," Pg 6. 6% of clients live on less than &dollar;1/day; 50% on less than &dollar;2/day.